Choosing the right speaker for your event can be a challenging task. Some event planners struggle for years to find the perfect guest speakers for their events. Most people are looking for speakers with a blend of humor and information that will leave the audience entertained and informed. Of course budget plays a crucial part in choosing a speaker as well. Here are some tips on how to choose the right guest speaker for your next event and audience. Humorist: Someone who delivers a speech with humor. Those who are experts in their field know how to blend humor with their message. Motivational Speaker: A speaker who provides an inspiring and uplifting message to the audience. Oftentimes this includes personal stories of success. Many of these speakers will use humor, but not as much as the humorist speaker. Celebrity: A famous name is sure to boost your attendance numbers, although it may come with a higher price tag. Industry: Great for niche industry and corporate events, these speakers are brought in to give an in-depth look into a professional industry. While generally not known for their entertainment or motivational value, they are great choices for educating your audience on a specific industry or product. 2. Entertainment versus message. What blend of entertainment value and meaningful message do you want? Some guest speakers give 100% entertainment speeches while others give 100% informational content. Most speakers will work with you and will adapt their speech to whatever amount of entertainment and information you want. 3. Fees and Budget. You don’t think a $30 purse is the same quality as a $300 purse, right? Similarly, a speaker that charges you $500 is not going to be the same quality as a speaker who charges $5,000 per speech. When debating how much to spend on a speaker, consider the amount of people in your event space and analyze the value-per-person attending to determine how much you want to invest in the speaker. 4. Check the speaker’s website. A website is basically like a modern day brochure, so it should give you a pretty good idea of the speaker’s professional ability. Check for any video clips, client lists and testimonials that can help you get to know the guest speaker better. A quality speaker will be easy to find on the internet and should generally appear on the first or second page of your search results for the topic you are searching. 5. Get testimonials and/or check references. Ask the speaker if they have any references you can call. They should have references readily available if they are a legitimate speaker. These past clients will give you an indication of the quality of the speaker. Be sure to ask them any questions you have and pay attention to the enthusiasm in their voice when they talk about their experience with the speaker. 6. View a performance or speech before hiring. Ask if they have any upcoming speeches planned that you can attend before booking them for your event. This is one of the best ways to see the speaker in action and make note of their presentation style and content. 7. Check their professional affiliations and awards. If your speaker is a part of a chamber of commerce or other professional association, it may indicate a higher level of commitment than one who does not have any affiliations. Also, look into any awards they have earned as this can be a good indication of their public speaking skills. 8. Find out how much they can customize the speech. Most guest speakers specialize in adding a personal touch to their speeches. If they don’t ask about the audience or organizational culture, be sure to tell them! While not every speech needs customization, it’s nice to make your audience feel special as if the speech has been tailored to them. 9. Ask what they will need for a meeting room setup. Be sure to have your speaker specify what you will need to provide at the event venue. Equipment such as the sound system, lighting, and projection equipment are typically needed for guest speakers. Ask if they want a podium or if they prefer to walk freely about the stage. There are also websites out there that can help you choose a guest speaker if you’re having a difficult time finding one. For example, Speakermatch has a database of thousands of speakers for you to choose from. Who was the best guest speaker you’ve ever seen? Who have you hired as a guest speaker for your next big event? Feel free to share with us by leaving a comment below, on Facebook or Twitter. 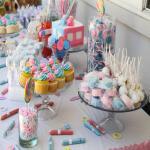 Baby Shower Party Ideas: Food, Games, Favors and More!